Closed until Monday, January 5th at 2 pm! I'll admit, my heart shattered in little pieces because i was so looking forward to some good high end vintage shopping. We began to walk a little further down the street where i came a cross another vintage shop I'd read about online! Yay it wasn't a total loss after all! Wow, it was a sea of Chanel, Louis Vuitton, Hermes etc. It was so fun to look around and see some of these gorgeous pieces in person. We were on such a tight schedule however, that i didn't want to rush into a decision I'd later regret so i wound up walking away empty handed. It was only our second day in Paris so i knew i still had time to find my big ticket item! As i mentioned before it was a dark, dreary, rainy, cold day! While walking the streets of Trocadero towards the tour bus we'd gotten passes for, we came across the most spectacular view of the Eiffel Tower! Yay photo op! We took a million pictures and admired this incredible structure. That was the one thing i could not get enough of. Seeing the Eiffel Tower in person is magical! Once we finished taking photos we took the bus to the Louvre Museum. We figured that a museum would be perfect for this cold rainy day. When we arrive, we nearly fainted looking at the 2 1/2 hour line to purchase entry tickets. Mind you, the waiting was all outdoors... in the cold... and rain! I was ready to give up but thankfully my friend Vilma (she's a firecracker that one) was determined to find a way in! 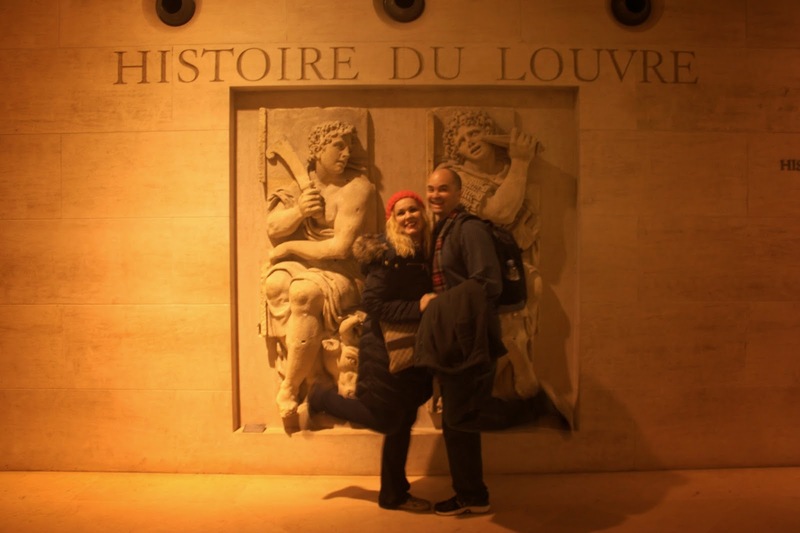 We walked toward the Louvre Hotel (which is gorgeous BTW) and walked in. We asked the gentleman at the counter if we could possibly use his computer to purchase and print out tickets to the Louvre. He told us he could actually sell us fast pass tickets himself for $16 Euros each! What???? We nearly cried with excitement. He was SO sweet! This guy was so amazing! He sold us the tickets and showed us the side entrance. We literally walked right in! As we're walking down the halls of the Louvre we kept asking ourselves, 'omg are we really here???' As you'd expect, the museum was incredibly crowded but breathtakingly beautiful. To see some of the paintings and statues I'd only read about in text books in person was nothing short of a dream. The Mona Lisa is way smaller than one would imagine. The crowds to see her and snap a picture are insane... still, i got my picture and loved that i got a chance to see this iconic beauty in person! 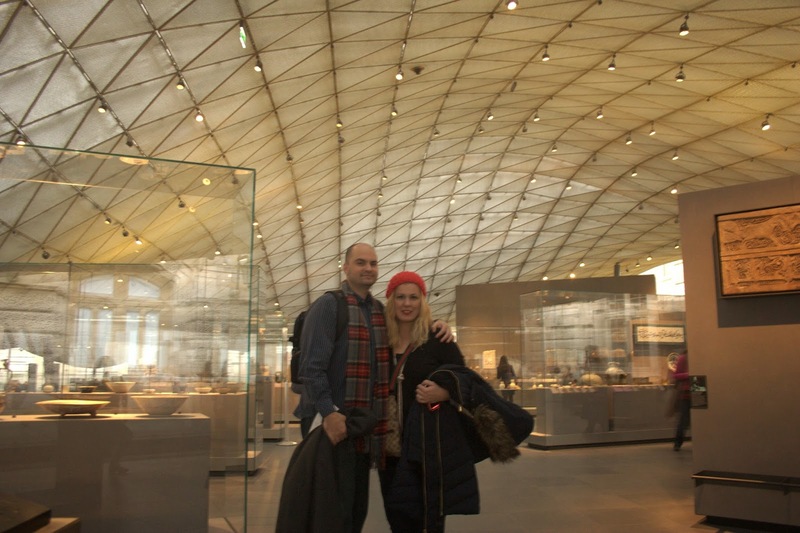 We spent about 3 hours at the Louvre and left with yet a lot more to see. When we left, we were starving but had no idea where to go. I wanted to go to Laduree and knew that it wasn't too far away. My hope was that there'd be a restaurant we could eat at near this macaroon heaven and head there for dessert. Well, we ended up rushing into a place that we somewhat regretted going to later. They were rude and it just didn't feel right. We ended up just ordering a french onion soup which really hit the spot since we were freezing. When we left there we went to Laduree. I was so excited to visit the place where macaroons originated. The store was decked out in pastels, crystal chandeliers and smelled divine! I got three macaroons because i simply couldn't decide. I didn't want to stock up just yet since we weren't leaving for another few days. We tried to go to the tea room next door but they weren't seating anybody anymore. This was 8 pm so as you can see, Paris, on a Saturday night is not exactly hopping! We walked down gorgeous streets decked out in white Christmas lights and nestled in cobblestone sidewalks that were quite a sight to see. I walked past many favorite stores... Chanel, Valentino, Prada... all closed! After walking another few miles, we wound up at the famous Place De La Concorde where the famous Parisian Ferris Wheel 'Roue De Paris' stood in all its glory! We purchased tickets and rode this beauty at night overlooking all of Paris! It was scary and super cool all at the same time! I'm afraid of heights so i was definitely uneasy but i can tell you that the views were so gorgeous that it made the whole experience worth while! The pictures aren't great because of the reflection of the glass but i wanted you to see what the view was like... so so beautiful! Since the Place De La Concorde stands directly in front of the Champs Elysees we headed that way to see what was happening. The first half of the Champs is a bit of a street fair. Lots of delicious food, chaud vin (hot wine), ice skating, shopping etc. It was pretty neat seeing this side of Paris. We feasted on the best sausage and peppers, shish kabobs, roasted chestnuts and hot wine. Soooo sooooo yummy! This is also where i purchased the most beautiful (and new favorite) winter hat. It's a fleshy pink knit hat covered in crystals and a fur pom pom (you'll see it in the next post or perhaps you've already seen it if you follow me on instagram ). As we walked past the fair section of the Champs, things began looking fancier and prettier. The street was covered in the prettiest lights and at one point we just stood there starring in aw at the beauty of this place. It was almost impossible to capture the feeling of what this place really looked like on camera. It's just spectacular! There were lots of high end stores (all closed except for MAC), restaurants etc. At the other end of the Champs Elysee was the famous Arc De Triomphe. We walked all the way there and finally got to see it up close. It was such a beautifully grand structure and while it was night time, it was still an incredible sight to see. Oh my gosh, I cannot even get over how gorgeous your pictures are. Paris is such an incredible place. I am so so glad you were able to go. Oh wow, these pictures are gorgeous! It looks like you packed a LOT of fun into this trip. Can't wait to see more! p.s. love your red lips + hat... too cute!! I'm so happy that you'll get to experience this amazing city! I want to go back sooo badly!